The idea was deceptively simple: New York Times bestselling author A.J. Jacobs decided to thank every single person involved in producing his morning cup of coffee. 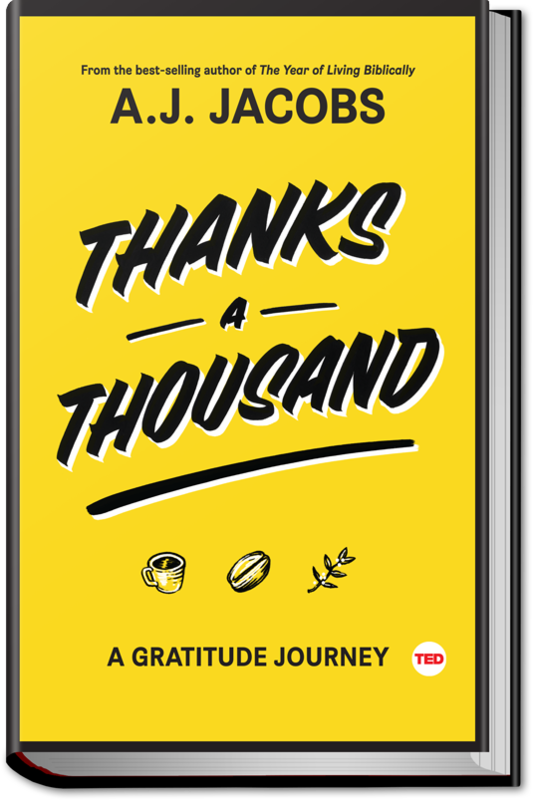 The resulting journey takes him across the globe, transforms his life, and reveals secrets about how gratitude can make us all happier, more generous, and more connected. conversations and establish human connections that deliver satisfying jolts of perspective." In celebration of the book, A.J. has pledged to write one thousand handwritten, personalized thank you cards to readers (carpal tunnel syndrome be damned!). As in real, pen and ink snail mail cards. If you have pre-ordered “Thanks a Thousand,” or if you have ever read one of A.J.’s other books, he’d love to thank you with a card he wrote himself. No outsourcing! NOTE: The snail-mail offer applies to U.S. readers only. If you are from another country, I’d still love to write you a handwritten note. But instead of sending it snail mail, I’ll write it, scan it and send it via email it to you. Thanks for understanding. If you like, please let me know any details you’d like me to include in the thank you card. It could be that you’re graduating dentistry school, or love the Seattle Seahawks or that it’s your sister’s birthday. Whatever.